A Beautiful, Healthy Smile that lasts a lifetime is our ultimate goal when treating our periodontal implant patients. Your personal daily Oral Hygiene plays an important role in achieving that goal. Your personal home care starts by eating balanced meals, reducing the number of snacks you eat, and correctly using the various dental aides that help control the Bacterial Plaque that cause periodontal disease and peri-implantitis. Tooth brushing – Brush your teeth at least four to five times a day (especially before going to bed at night) with an ADA approved soft bristle brush and small amount of toothpaste. Our Butler Sub G and End Tuft brushes are one of the softest bristle available. Place the brush at a 45 degree angle to the gums and gently brush using 6 small circular motions, and then rolling down 3 times. Start on the upper right and do one tooth at a time and progress to the upper left. Then go to the tongue side of the upper left and return to the upper right side. Then go to the cheek side of the lower right and proceed to the lower left. Then move to the tongue side of the lower left and proceed to the lower right. Brush your tongue and roof of your mouth 6 times to remove Bacteria Plaque and freshen your breath. The End Tuft brush will be used on the back half of the last teeth and then in between all of your teeth. Again rotate in 6 circular motions and roll down or up 3 times. Electric toothbrushes may also be recommended. They are easy to use and can remove Bacterial Plaque efficiently. Simply place the bristles of the electric brush on your gums and teeth and allow the brush to do its job, one tooth at a time. By doing so you will overlap the previous tooth. Flossing – Daily flossing is the best way to clean between the teeth and under the gumline. Flossing not only helps clean these spaces, it disrupts bacterial plaque colonies from building up, preventing damage to the gums, teeth, and bone. A tooth has 4 surfaces and the tooth brush only gets two of them. The dental floss will get the other two surfaces. Take 24-30 inches (60- 76 cm) of dental floss and wrap it around your middle fingers, leaving about 2 inches (5cm) of floss between your thumb and index finger. Using your thumbs and index finger to guide the floss, gently insert the floss between the teeth. Do not snap it inbetween the teeth in fear of traumatizing the gums. Wrap the floss into a “C” shape around each tooth and under the gumline. Gently move the floss up and down, cleaning the side of each tooth. Only apply pressure to the floss as it moves toward the chewing surface. We want it to be "squeaky clean." Whenever you go between two teeth you have two surface to clean. 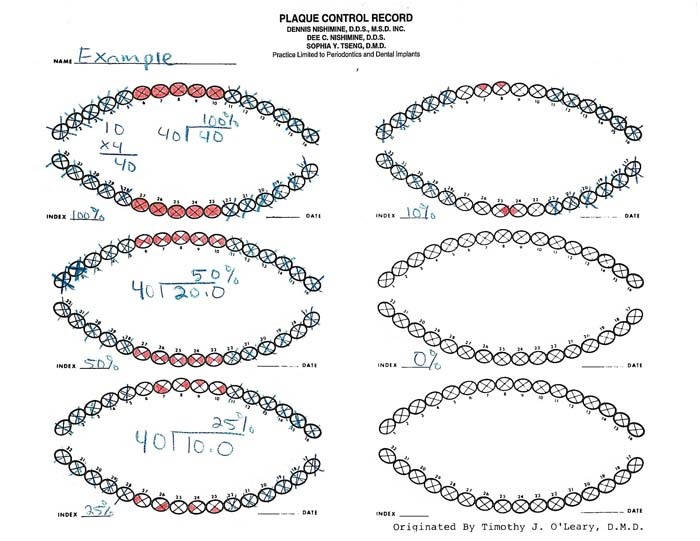 Plaque Control Record by Timothy J. O'Leary, DMD will be utilized in you Oral Hygiene Instruction (OHI) program with a disclosing agent. This is a simple percentage or score. If all of the surfaces stain with Bacterial Plaque you have 100% and all surfaces are covered with Bacterial Plaque. We want your scores to be below 10% or few to no bacteria present.